For Windows Developers who need to capture image from scanner, digital camera that has a TWAIN device driver and save to Docx, TIFF , PDF/A with C#, C++ ,VB.NET , VB, Delphi, VFP, MS Access. Scanning automatically without any user interaction , save to to a multipage TIFF or PDF until the ADF tray is empty. Use an automated document feeder (ADF) for single and multi-page scanning. Has ability to detect paper jam event. 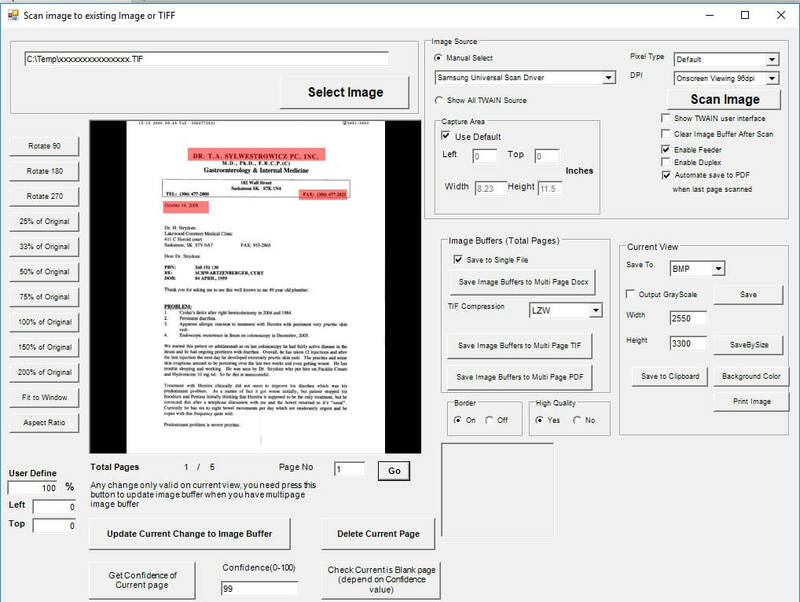 Capture images from all the TWAIN compliant scanner and webcam devices and save to Microsoft Word ( docx ), PDF, BMP, GIF, JPEG, JPEG 2000, PCX, PNG, PSD, TIF, TGA, PGX, RAS, PNM image files. Support add texts to specific page when save to multi-page Microsoft Word ( docx ) file. Support use JPEG compression, adjust quality when save to PDF/A file, (Save, SaveBySize, SaveAllPage2PDF, OCR2SearchableMultipagePDF methods ) . It can output small file size of PDF/A file. Support convert scanned images to 1bbp, 4bbp, 8bpp, 8bpp Grayscale, 24bpp, 32bpp, 32ARGB bpp, it can reduce the output file image size. e.g. PDF, TIF files. Support PDF Annotation before save to PDF/A file, add fonts, images, draw text, rotated text , line, rectangle to PDF file. Support save as multipage TIFF ( JPEG, Packbits, LZW, CCITT G.3 and G.4 compression) and multipage PDF or PDF/A file. With JPEG compression of TIFF file, it can reduce file size of TIFF file. Support save as 1bpp, 4bpp, 8bpp, 24bpp TIFF file. Has ability to enable/disable progress bar when scanning. Has ability to adjust the scanner capture area. Has ability to work with automatic document feeders ( ADF ) scanner devices. Delete specific scanned page before save to image file. Adjust brightness, Contrast, Gamma, Hue, Saturation of scanned image file. Include delphi, c# 2015, c# 2010, Access, VB.Net 2015, VB.Net 2010, Visual Basic , Visual C and Visual FoxPro sample code. 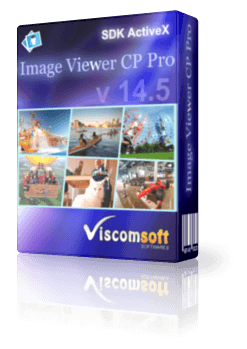 Compatible with any programming language that supports ActiveX (Access, Visual C , Visual Basic , Visual Foxpro, Delphi, .Net, etc.). fixed When calling OCRStartScan() or OCR2SearchableMultipagePDF() if the region you have selected the zone using OCRSetRect() is a blank area with no text, it have crash issue. fixed cannot scan a lot of images , because out of memory issue. Now added BufferResizeMode property. It can resize large images. it can save a lot of memory. fixed loading large PDF crash issue and loading large PDF file faster. added Advanced Barcode Recognition for PDF features, it can Open the PDF, Get the total count of images for specific PDF page and scan the Barcode for specific image. It can improved the barcode recognition. In old version cannot detected Barcode on PDF file. now it can solved it. fixed when OCR , OCRRecognizeMode=0, sometime application close issue. fixed LoadImage method that load the PDF, then call LoadImage method again with same PDF file. the view size is different issue. added BarCodeReadPDFClose, BarCodeReadPDFImageCount, BarCodeReadPDFOpen, BarCodeReadPDFScan methods. added BufferResizeMode, BufferResizeScale, BufferResizeMaxWidth properties. updated VB6, C# 2010, C# 2015, VB.NET 2010, VB.NET 2015 1D-2DBarcodeDemo samples. added C# 2010, C# 2015 OCR sample. updated VB6, C# 2010, C# 2015, VB.NET 2010, VB.NET 2015, VFP General samples. added VC header files in VC-ScannerProClass folder. added PDFAddImageFromFile method support input PNG file. added PDFAddImageFromFile2 method that support input JPEG, TIFF, PNG with chroma-key mask. Improve the Barcode Recognition Speed, it support custom define different parameter of Barcode reader engine. Including enable/disable rotation with different angle, enable/disable scan multiple barcode, Enable/Disable spend more time to try to find a barcode, optimize for accuracy. added BarCodeReadCustomRotation, BarCodeReadScan45CouterRotation, BarCodeReadScan45Rotation, BarCodeReadScan90Rotation, BarCodeReadScanAccuracy, BarCodeReadScanMultiple, BarCodeReadScanWithoutRotation properties. updated VB6, VB.NET 2010, VB.NET 2015, C#2010, C#2015 VFP Barcode samples. added support output searchable PDF file with PDF annotations in same time. Now you may call OCR2SearchableMultipagePDF method and add images, draw text, rotated text, lines, rectangle to PDF file in same time. added PDFRenderDPIX and PDFRenderDPIY properties. It allow increase the PDF resolution when loading PDF file, It will improve barcode reader recognizing result. added support set the paper size when save to PDF file. added support select the font name or font file name when save to Unicode PDF/A file. added support OCR to Unicode Searchable PDF/A. updated PDFUseJPEGCompression and PDFJPEGQuality properties that support Save to PDF file. updated VB6, VFP, C# 2010, C#2015, VB.NET 2010, VB.NET 2015 OCR, OCRPDF, LoadImage samples. fixed EndAllScan and DirectScannedAllPage event cannot fired issue, These events is useful , it can let Scanning automatically without any user interaction , save to to a multipage TIFF or PDF until the ADF tray is empty. added C# 2015, VB.NET 2015 samples. redesign the barcode reader plugin, now support 1D and 2D barcode. Supported UPC-A, UPC-E, EAN-8, EAN-13, Code 39, Code 93, Code 128, ITF, Codabar, MSI, RSS-14 (all variants), QR Code, Data Matrix, Aztec and PDF-417. added VB6 , VB.Net 2010 1D-2DBarcodeDemo samples. added EndAllScan and DirectScannedAll Page events. Allow scan multiple pages using a scanner with feeder, automate save to multipage PDF or TIFF when last page scanned. added ScanningError event. support detect paper jam event. fixed when there is no paper in the feeder, the program goes into a loop and never ends or fails issue. updated vb6, vb.net 2010, c#2010, vfp, delphi samples. fixed LoadImage cannot load large TIFF file. fixed SelectImageSourceByIndex() return incorrect value. added vb.net 2010, vb6 Scan image to existing image or TIFF samples. updated delphi, vb6, vb.net 2010 samples. added support load images file (bmp, jpg, png, gif, multi-page tiff) from hard drive. 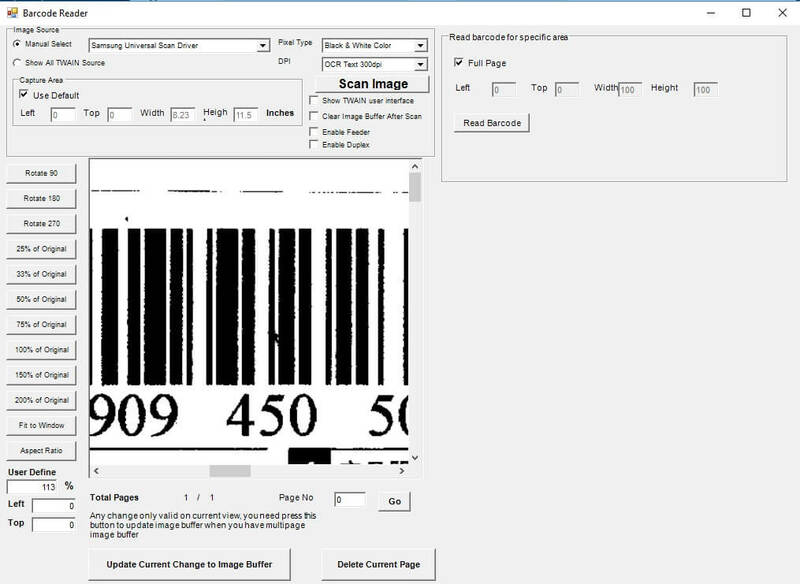 You may loaded the image file, then use Barcode reader and OCR plugin too if you have these plugin. added support load the image file from hard drive, then scan the image, it will append the scanned images to buffer. added allow the scanner automatically detecting the paper size if your scanner has this capability. fixed some bugs when save the image files. fixed dpi have not changed , even set dpi property when call save or savebysize methods. fixed cannot output PDF file when Bpp is 1, Bpp is 8 and called OCR2SearchableMultipagePDF method. added Direct Scan to Disk feature, it allow scan a lot of pages , without worry about memory issue. added support merge scanned image files to TIFF files from specific folder. added support merge scanned image files to PDF files from specific folder. added DirectMergePDF, DirectMergeTIF, DirectScanInit, DirectScanClearAllPages methods. add hide progress bar when scanning. fixed it will output .tmp file when call OCR2SearchableMultipagePDF(). added java script web page sample. 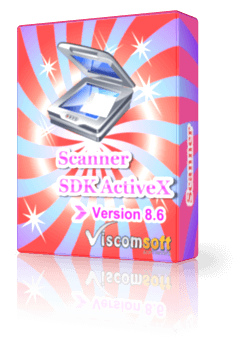 show you how to using the scanner activex on web page. fixed Twain Driver box stays open after scanned the image. added support convert scanned pages to single or multi-page Microsoft Word (.docx) File. added support add texts to specific page. when create multi-page Microsoft Word (.docx) File. updated vb6, vfp, access, c# 2010, vb.net 2010 samples. added vb.net 2010 and c# 2010 samples , fixed samples cannot run on 64 bit OS issue. added allow select Asynchronous Mode or Blocking Mode when call OCR2SearchableMultipagePDF and OCRStartScan method. added if selected Asynchronous Mode and call OCR2SearchableMultipagePDF method, it will fire OCRPDFA event. improved OCR engine. Now OCR processing will more accurate when you call OCRStartScan or OCR2SearchableMultipagePDF methods. fixed repeat OCR same document, each time OCR text result will different issue. updated Barcode reader, Now barcode reader will more accurate. fixed cannot control duplex setting issue when DuplexEnabled property is true. added Blank Page detection, Get the Confidence value of specific page. 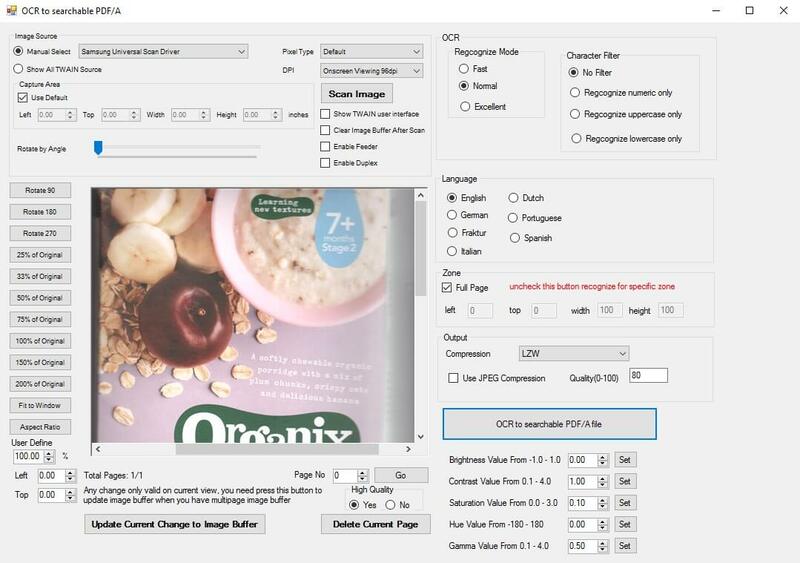 added allow use JPEG compression, adjust quality when save to PDF/A file with Save, SaveBySize, SaveAllPage2PDF, OCR2SearchableMultipagePDF methods . It can output small file size of PDF/A file. added allow Enable/Disable the scanner automatically feed the next page from the document feeder. added BlankPageGetConfidence and BlankPageIsBlank methods. added support delete all scanned pages. updated SelectImageSource method, it will return false if select Cancel button in select source dialog. fixed have not clear PDF Annotation issue. now add PDF Annotation and save to PDF file, then it will clear PDF Annotation. updated OCR engine, the recognizing time will faster than 3 times when use OCRStartScan,OCR2SearchableMultipagePDF methods. 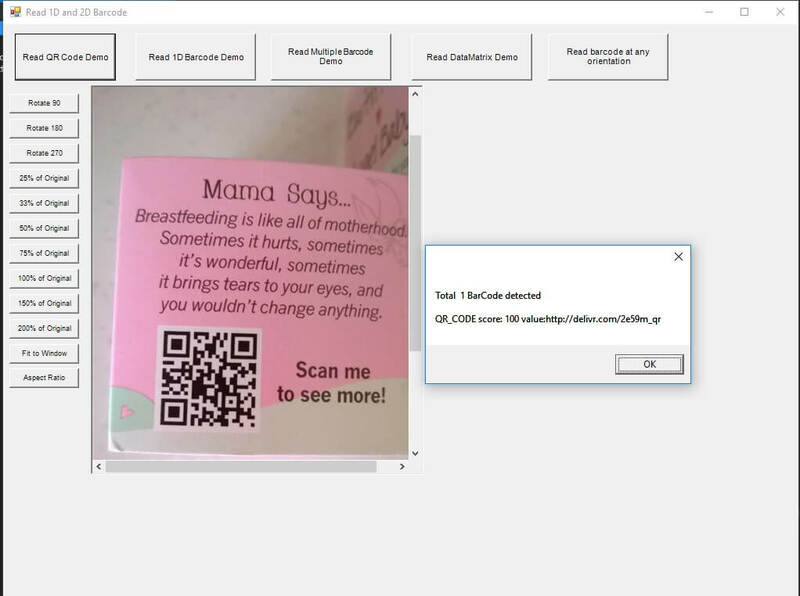 updated BarCode Reader engine, improved the recognizing quality. added support PDF Annotation before save to PDF/A file, add fonts, images, draw text, rotated text , line, rectangle to PDF file. added allow add BarCodeReader Plugin. added PDFAddFont, PDFAddImageFromFile, PDFDrawFillRectangle, PDFDrawImage, PDFDrawText, PDFDrawTextAlign, PDFEmbedFont, PDFInitAnnotation, PDFSetTextColor methods. added BarCodeGetScore, BarCodeGetType, BarCodeGetValue, BarCodeReadByZone,BarCodeReadFullPage methods. added support save as JP2, JPC, PCX, TGA, PGX, RAS, PNM image format. added support use JPEG compression with TIFF file. added allow change bpp to 1bpp, 4bpp, 8bpp, 8bpp grayscale, 16bpp RGB555, 16bpp RGB565, 24bpp, 32bpp, 32bpp ARGB. It allow output small file size of TIFF and PDF file. added CovertTo1bpp, CovertTo4bpp, CovertTo8bpp, CovertTo8bppGrayScale, CovertTo16bppRGB555, CovertTo16bppRGB565, CovertTo24bpp, CovertTo32bpp, CovertTo32bppARGB methods.